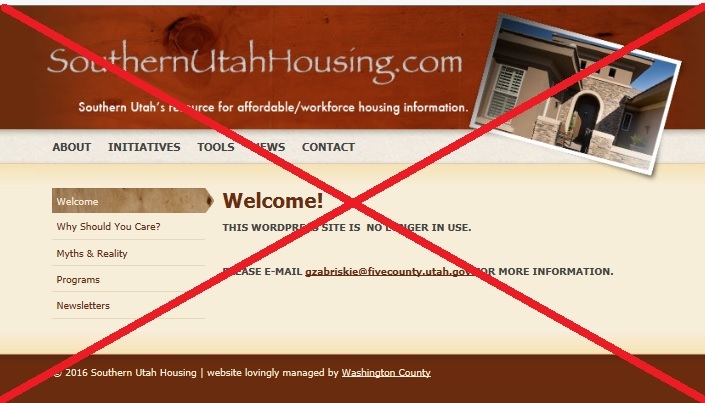 The SouthernUtahHousing.com website has been permanently taken off-line. Questions regarding affordable housing issues in southwestern Utah may be directed to Gary O. Zabriskie, Director of Community and Economic Devleopment at the Five County Association of Governments. He can be reached by e-mail at gzabriskie@fivecounty.utah.gov or by telephone at (435) 673-3548 extension 126. CLICK HERE to go to the home page of the Five County Association of Governments.